The Little Cafe at the End of the Pier is the Cafe at the End of the Pier novellas collected together for the first time. 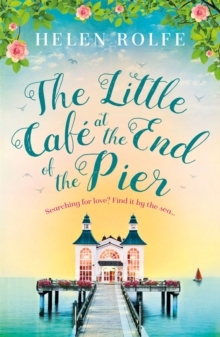 When Jo's beloved grandparents ask for her help in running their little cafe at the end of the pier in Salthaven-on-Sea she jumps at the chance. The cafe is a hub for many people: the single dad who brings his little boy in on a Saturday morning; the lady who sits alone and stares out to sea; the woman who pops in after her morning run. Jo soon realises that each of her customers is looking for love - and she knows just the way to find it for them. She goes about setting each of them up on blind dates - each date is held in the cafe, with a special menu she has designed for the occasion. But Jo has never found love herself. She always held her grandparents' marriage up as her ideal and she hasn't found anything close to that. But could it be that love is right under her nose...? **The Little Cafe at the End of the Pier is the collected Cafe at the End of the Pier novellas.